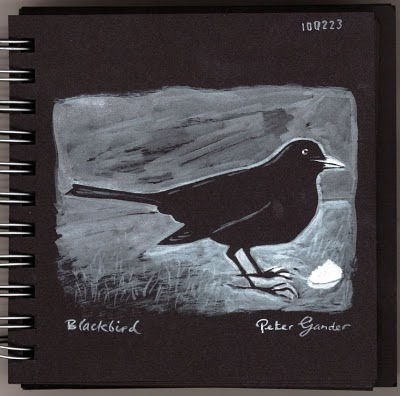 Inspired by the six blackbirds that I saw on my lawn at the weekend. Probably making the most of the waterlogged soil thanks to the persistent rain we've been having, to get at some earthworms. White ink on black sketchbook. 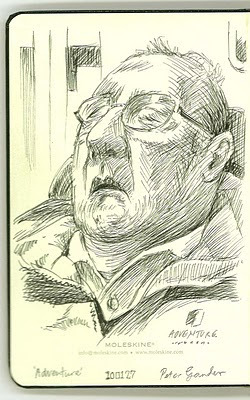 Sketched this on the homeward train last night. The blue (QUink) wash added this morning. 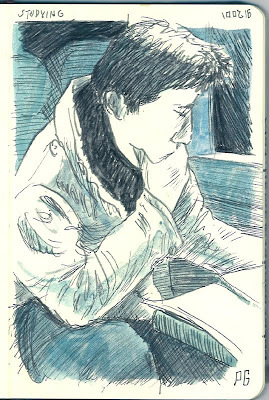 This chap was obligingly still as he was engrossed in studying for quite some time. Fountain Pentel on Moleskine sketchbook. Well, admidst the three inches of snow in Kent at the moment, I thought I'd send a ray of sunshine in the shape of this watercolour of a couple of years ago. The minnow hunters in question are my children, Hannah & Jack. They were looking for tiddlers in a stream which fed the mighty river Avon in Hampshire. 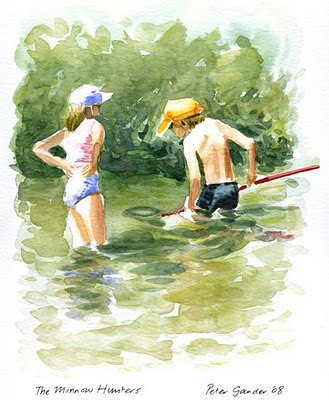 Painted from photographic reference, but with a healthy portion of artistic licence in omitting unnecessary background detail, I think it nicely conveys the seemingly endless summers of youth. 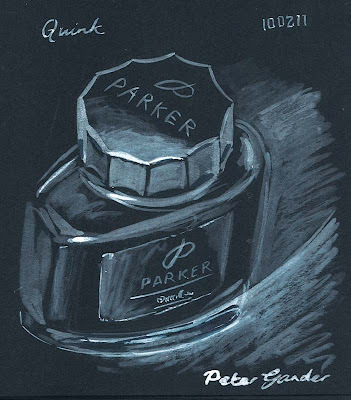 Still on black paper and white ink, this lunchtime I did a still life of what was close at hand, my little Quink Ink pot. It's a brain-teaser trying to work out where a white becomes a grey and a grey becomes a black when you're effectively painting in reverse, with a white medium. 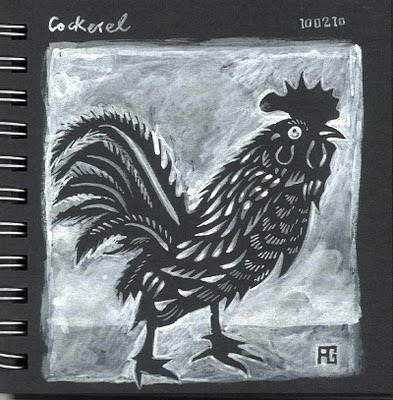 Today's lunchtime sketch, a Chinese-style cockerel painted in white ink in my black paper sketchpad. Painting the fiddly tail feathers in the negative was a little tricky and not wholly successful, but the inner body feathers in white on black are effective, especially where the white ink sinks in giving varying strengths of white, depending on how dilute it was. A quick backtrack to Christmas and a case of 'artist imitating frame' here. I bought this amazing (Indian?) 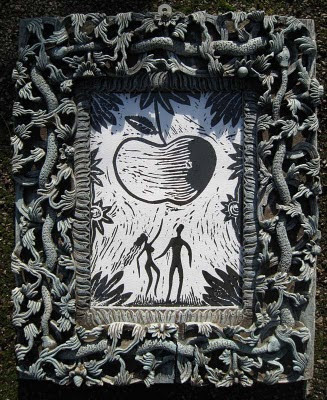 carved wooden frame from a lovely antique shop called Warehams in Whitstable for my girlfriend Fiona. It was unglazed but that was soon remedied by a visit to a local glaziers. 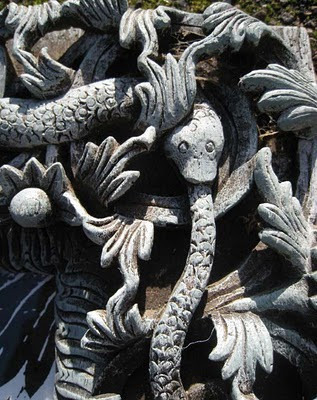 The frame is intricately carved in a pierced style and reveals four snakes eating each other's tails around the edge. Surrounding these creatures is a jungle of delicate leafwork and flowers. 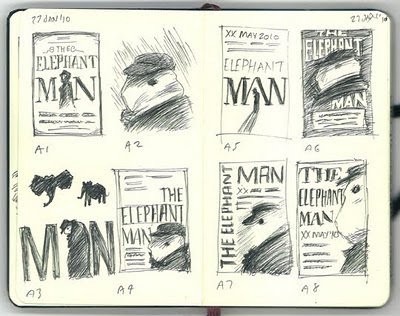 Peter, a good friend of mine is directing a stage play version of ‘The Elephant Man’ for The Sawbridgeworth Players (Herts, UK) in the spring and has asked me to come up with some ideas for the poster. 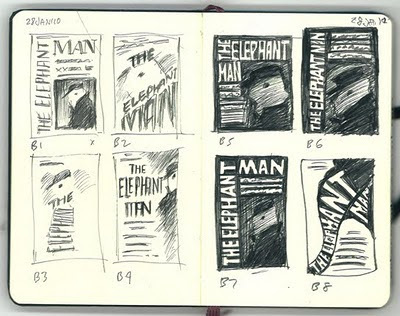 These Moleskine scamps (or thumbnail sketches) are a neat and practical way of getting the first seeds of ideas in my head onto a page, without thinking too much, or perhaps thinking more intuitively. It's a practise I do every working day in my art director role - scamps are a useful way of 'viewing the idea from a distance'. In taking very litte time on each early idea and keeping them on a small scale, it allows the designer/artist an 'at-arms-length' viewpoint, much like standing back from a canvas, the proportions and dynamic elements are seen much more easily. It doesn't pay to be precious about minutaie at this point - it's about filtering out the good ones with potential. Next stage, I'll draw/sketch up bigger versions of our joint favourites (a maximum of three) from which the final design will proceed. 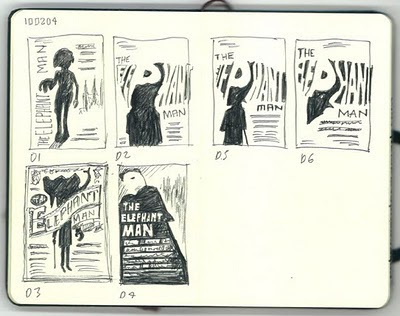 I am thinking along the lines of a design and medium to suit both the atmosphere and the period of the play - 'Victorian woodblock billboard poster'-style, perhaps with an linocut image. Charcoal also would be suitably gritty! Titled somewhat ironically as the guy is obviously asleep, but he had the word Adventure emblazoned on his outdoor coat. Hey, everyone’s entitled to a day off from climbing Everest. 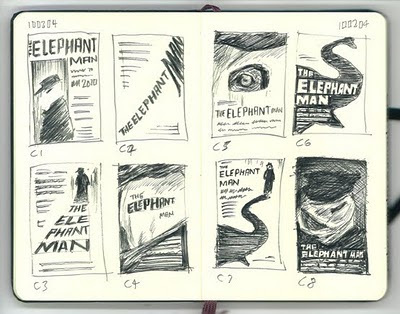 This was my very first drawing to christen my new (and first) Moleskine sketch book. Sleeping models are such useful subjects. Apart from the odd waking up episode where he eyed me suspiciously, he resumed his pose well. Anxious never to waste a single spare centimetre of paper, I sketched this on the inside front cover. Fountain Pentel on cream-coloured Moleskine pad.